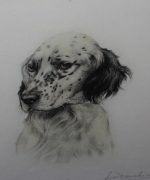 The Leon Danchin Etchings, Prints and Pictures below represent a small selection of the many Dog Paintings available. If you can’t see the Leon Danchin that you’re looking for then please contact us on 07889 800857. Danchin was born in Lille (France) on 21 June 1887, the second of six children of Albert and Margaret Danchin. For centuries, the Danchin family lived in northern France, in Anchin in Hainaut, where the family name originated. In 1919, Danchin married Simone Meesemaecker. For ease of working, Danchin moved his family to Chantilly, close to Paris. His first works sold very well in France, and also in Belgium, the United States, and England. 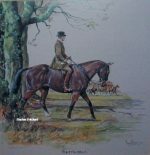 Danchin later moved to Bergues, in the French Flanders, where he was able to hunt regularly. 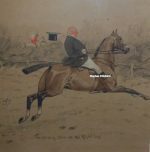 It was during this period that he drew many of the hunting scenes for which he is renowned.